Supernatural lightens the mood a little by focusing on lifting Dean out of his funk through his love of Horror films. Part of the appeal of this show for me as a fan is the versatility of the storytelling. No other show has the confidence or ability to go from apocalyptic stakes to straight up meta comedy and manage to pull it off. This is one of the more subdued outings as it doesn’t approach breaking the fourth wall but it’s still a departure from the darkness and intensity that have defined the season so far. The word filler gets thrown around in television a lot, particularly on a network TV series that have large seasons. Not everything can be dominated by the main arc because the risk of becoming repetitive increases if every episode focuses on the same endgame. The best kind of filler feels like something of a palette cleanser that can entertain without trying to be anything more than it isn’t. “Mint Condition” is largely such an episode that does what it needs to do without attempting to be profound. 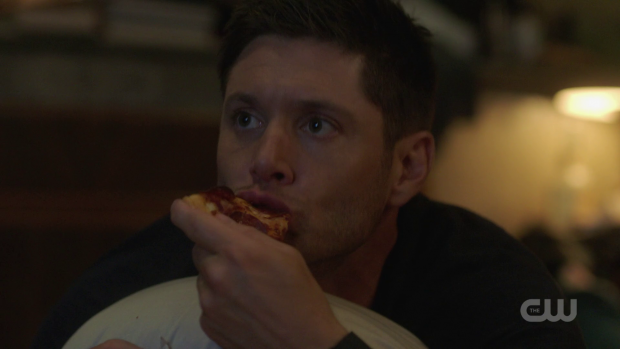 Early on in the episode Dean is indulging in some much needed me time where he spends time in bed eating pizza and watching schlocky horror movies. It’s a very Dean way to unwind in keeping with established character traits while setting up the horror tropes that the episode will attempt to have fun with later on. Sam takes it upon himself to shake Dean out of his funk by finding a case that he will be personally interested in. It’s a very small detail but an important one as it further reinforces the strong brotherly connection that underpins this show. Sam is concerned for Dean’s mental health and knows exactly what Dean needs at this point. The case itself is fairly mechanical in terms of how Sam and Dean approach it. A man being attacked by a toy points to a ghost pretty early on so it’s just a matter of finding the cursed object and dealing with it. To find this out the Winchesters have to talk to people, find clues and finally solve the mystery so that they can destroy the object to end the ghostly threat. It’s basically another day at the office which may make the story itself fairly standard and predictable but this allows more opportunity to have fun with the characters though the episode never quite manages to establish any sort of threat. Dean definitely has a blast in this episode as he gets to nerd out about some of his favourite horror movies with like minded individuals while Sam rolls his eyes. It’s always good to remember that Dean is a nerd at heart and isn’t ashamed to let people know. As I mentioned this particular case is perfect for him and he definitely takes more than a little joy out of being involved in it. This characterisation isn’t superficial either as his love of horror movies has really profound roots. Even though his daily life resembles a horror movie he enjoys the escapism of watching them because of the certainty that the bad guy will lose in the end. Dean fights evil on a daily basis without knowing if he’ll be victorious or survive the experience so watching fictional characters deal with a familiar yet exaggerated situation is comforting to him. The possession of a life size hatchet man makes for a clever way for the show to compare the real life situation to a similar one in the movies featuring that character. Unlike the fictional victims Dean knows what he’s dealing with and doesn’t make the mistakes that facilitate those characters dying a gruesome death. Dirk (Aaron Paul Stewart) in contrast fails to listen to practical advice and almost ends up getting killed for his blunder. Despite having an extensive knowledge of horror movies he lacks the self awareness to realise that he’s making the same mistakes that he would laugh at. The scene where Hatchet Man chases Dirk around the hospital is brilliantly done with the real life chase mirroring the movie version almost exactly which reinforces the “life as a horror movie” theme that Sam introduces earlier in the episode. Another trope the episode plays with is that the killer chases someone who arguably deserves everything they get. The ghost’s intended victim, Stuart (Kurt Ostlund) is repeatedly shown to be short tempered and unpleasant. He’s not a very likeable character and encourages the ghost’s vengeance by stealing from the comic book store he works in. 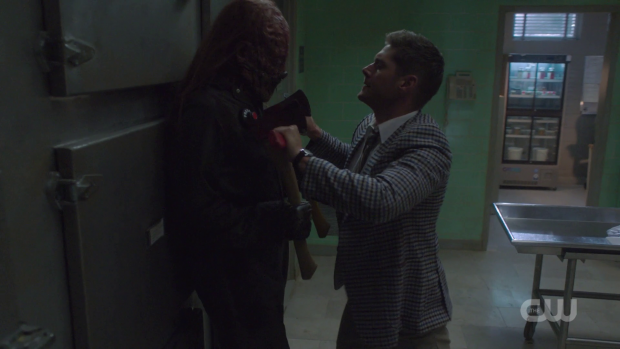 Of course nobody deserves to be hacked to pieces by a hatchet but I’m that horror movie watcher who often roots for the killer to dispatch the insufferable characters and Stuart is such a perfect version of that sort of character in the Supernatural style. By the end of the episode Dean appreciates what Sam did for him, opens up a little about how he has been feeling and seems to be a little better than he was in the beginning. It definitely helps that he was able to crack wise throughout and bicker with his brother in a really playful way. At the very least he’s finally ready to accept that saying “Yes” to Michael was well intentioned even if he still feels guilty about everything that was done while Michael was in control. As I said earlier this episode was a palette cleaner in a dark season and calls back to a simpler time where the show was just about two brother putting an end to evil supernatural threats. An entertaining if largely disposable episode that offers some fun character development for Dean who gets to experience a case that he can enjoy in an attempt to lift him out of his funk. The case itself is fairly by the numbers which leave plenty of room for fun moments. Horror movie tropes are used in fun ways to contrast Sam and Dean’s real life with the fictional version. Similarities and differences come through clearly and the episode is generally a lot of fun. By the end of the episode Dean is a little better off than when it started. He’s ready to open up about his feelings a little as well as accept what Sam has to say about his choice to let Michael possess him. Even though he feels guilty he can accept that he made the decision for the right reasons. This is the sort of episode that acts as a palette cleanser and a throwback to a simpler time.